ADAB solutions is a newly founded cryptocurrency project for countries and ardent followers of Islam. Presently, this is no doubt the first cryptocurrency project and its processes do not contradict Islamic Sharia Law. However, the major objective of the project is to manage crypto assets of high moral values for Islamic states. These will help in the making globalized cryptocurrency ecosystem that will be useful for Muslims and the world at large. The Sharia Advisory Council will feature as the head of project structure which supervises the project activities. ADAB solutions serve as a first decentralized platform for initiation of halal projects. ADAB Solutions is developing the First Islamic Cryptocurrency Exchange (FICE) according to the Islamic tenets. ADAB Solutions will help build a service on the basis of cultural values and moral standard of Islam full of transparency such that makes is easily accessible to every crypto users. With the Islamic values of this project, it will help to fruition the Islamic finance which is based and rooted on the tenets of Sharia. You will agree with me that Islamic economic model of the modern world is among one of the progressive aspect of our modern economy. FICE stands for the “First Cryptocurrency Exchange” which go in-line with the norms of Shariah. A lot of crypto money project, due to their characteristics are haram according to Islamic belief. Moreover, in today’s world no one can be assure that the ICO projects enlisted on the general cryptocurrency exchanges conform with Islamic norms. There will be no margin trading or operations which does not corresponding to the norms of Shariah at FICE. Moreover, there will be additional listing requirement for the authorization by its Shariah Advisory Board. These limitations will not be enforced only for religious reasons alone but include low-quality appearance of assets on the exchange. 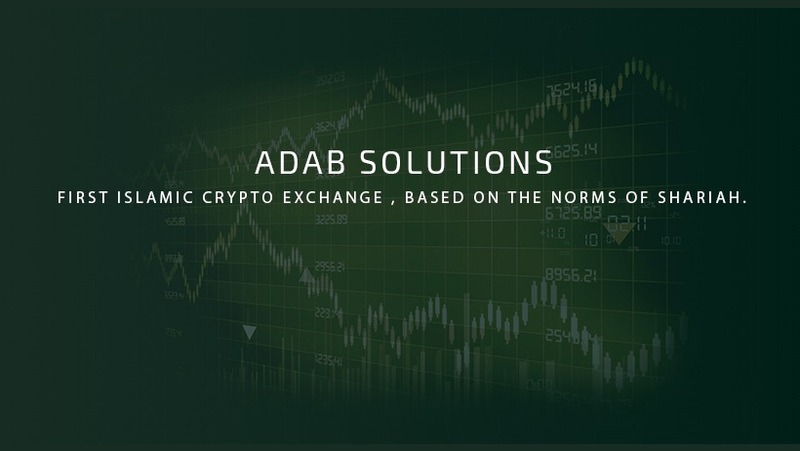 ADAB Solution is here to solve problems of lack of moral value in crypto assets possession and building Islamic cultural values by creating a globalized cryptocurrency ecosystem for the benefit of everyone. Ethical insecurity of Muslims as regards the acceptability of shady deals on the crypto market will easily leads to hostility, and as a result of this, there will be non-involvement of Muslim community in the technologically inventive financial institution, ADAB Solutions project will solve these numerous problems. ADAB solution will be the first ever exchange in accordance with the norms of Islam. Presently, there is more than one cryptocurrency exchange platform that would protect the activity and go in-line with the principals of Shariah. The Islamic Ummah population cut across t about 120 countries both in Western, Central, South and South-East Asia, Europe and North Africa. In 35 of these countries, Muslims are majority of their human population. Also, about 28 countries includes Saudi Arabia, Egypt, Morocco, Kuwait, Iran , Pakistan and others, this is because Islam religion is a state one gaining a new market ecosystem. ADAB project makes easy the application to crypto-economical values which is based on the Sharia norms and the Islamic finance principles of Islamic. The moral values will become the basis for regulatory of cryptocurrency market and will help scale confidence level in key into instruments. ADAB project is among the highest in security standards and unique technical software solutions in conjunction with safe and reliable jurisdictions. Development of new markets: The project of ADAB will attract millions of users who previously have not invested in any cryptocurrency assets and which will be beneficial to the entire crypto-economy as a whole. It will also increase new participant that has previously observed the project development from the side view. First Islamic crypto Ecosystem: The project will enable it possible for the performance of cryptocurrency transactions and as such will be in accordance with Islamic financial principles which will come in agreement with the basis of Shariah laws. Cost effective of ICO: Initially, the issued tokens number is the maximum and final. The tokens of number will decrease and price will increase. High potential growth of token value: Expected growth of client base and transaction volume on FICE will be the influencers of the ADAB token price, only cryptocurrency values are used to pay the service commission in the project. Development Contribution of Islamic financial: ADAB tokens allow the participation of the project which is designed community of larger Islamic population. It will not only share benefits of emerging into a fast-growing marketplace of Islamic crypto-economy, also contribute immensely to developmental new application areas of Islamic finance. Shariah Advisory Board: This group will ensure the total compliance by the norms of Islam in accordance with FICE activities through an independent regulatory which comprise of a reliable expert in the aspect of Islamic finance. Islamic Management Model: ADAB Solutions will be overseen in-line with requirements of Islamic corporate system of governance which is developed solely on the basis of standards. Charitable Foundation ADAB Charity: In each Quarter, 2.5% of the annual net profit and 5% of net income of this project will serve as a form of the basics such that everyone can contribute to this fund through Adab Charity fund. Independent certification: As an independent certification of regulatory, legal documents and procedures. Annual audit: Adab Solutions will make an annual audit to know the compliance of Islamic finance through reputable and independent companies. In conclusion, ADAB Solutions is developing the First Islamic Cryptocurrency Exchange (FICE) according to the Islamic tenets. ADAB Solutions will help build a service on the basis of cultural values and moral standard of Islam full of transparency such that makes is easily accessible to every crypto users. With the Islamic values of this project, it will help to fruition the Islamic finance which is based or rooted on the tenets of Sharia. ADAB solutions totally allow it employees to work for the company’s benefit such that are ready always to help it user as needed.